Researchers in Germany have employed a plasma protein found in blood to develop a new method for making wound-healing tissue scaffolds. The team's new scaffold can be attached or detached from a surface, for either in vitro laboratory tissue studies or direct applications in the body. Their discovery, reported today in the journal Biofabrication, could be extremely useful for future use in wound healing and tissue engineering. Lead author Professor Dorothea Brüggemann, from the University of Bremen, said: "The protein we used is called fibrinogen. It is an extracellular glycoprotein found in blood plasma and plays a major role in wound healing by assembling into a fibrous network to form a provisional extracellular matrix (ECM) that helps with wound closure." Because of its versatile molecular interactions, fibrinogen is often processed into hydrogels and fibrous scaffolds for cell culture and tissue engineering applications in vitro. However, existing ways of doing this—such as electrospinning or the preparation of fibrin hydrogels—use organic solvents, high electric fields or enzymatic activity, which change the molecular structures or native protein functions of fibrinogen. To solve this, the team wanted to find out if they could develop a simple and well-controllable way to make three-dimensional scaffolds while retaining fibrinogen's properties. Professor Brüggemann said: "For the first time, we were able to assemble fibrinogen into dense, three-dimensional scaffolds without using high voltages, organic solvents or enzymatic activity. Our biofabrication process can be controlled simply by adjusting the fibrinogen and salt concentration, and the pH range." ECM fibres and fibrin fibres in blood clots.Professor Brüggemann added: "This novel class of fibrinogen nanofibres holds great potential for various biomedical applications. For example, in future studies on blood coagulation our immobilised fibrinogen nanofibres could provide a valuable in vitro platform for initial drug screening. 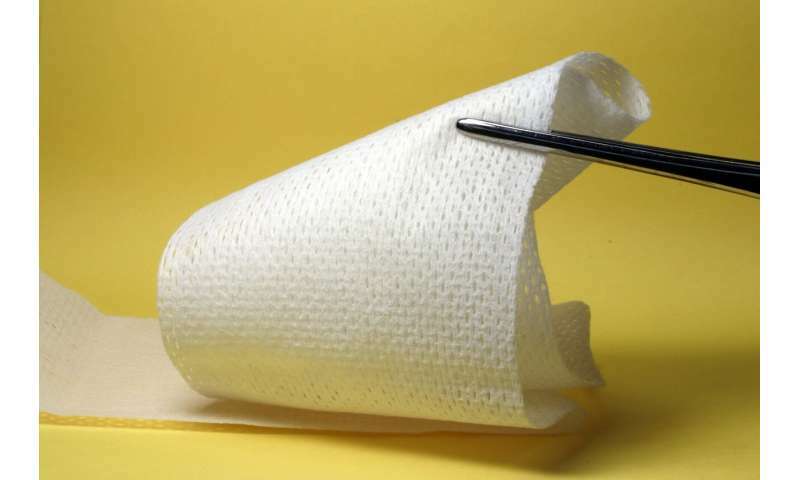 On novel wound healing applications, it will be highly interesting to study the interaction of fibroblasts and keratinocytes with our free-standing fibrinogen scaffolds."